A female Hairy Woodpecker clings to a suet feeder as snow falls in Jan. 2015. If you live in New England you’re about to buried in snow so why not studies these photos and learn the differences between the hairy and downy woodpeckers. Beginning birders often confuse the two species. I know it took me a long time to be able to tell the two woodpecker species apart with confidence. Hopefully this posting will help some of you distinguish between the two. The two species are hard to tell apart because they basically look exactly the same, hence the confusion. The major difference is the size. The downy is a dainty six inches, while the hairy is a beefy nine inches. That’s enough of a difference that you’d think it would be easy to tell one from the other. But if you’re new to this birding thing and don’t have a point of reference to judge size, it’s tough. I know, I’ve been there. Plus, like any birds, there can be size variations within a particular species. There can be smallish Hairy Woodpeckers and largish Downy Woodpeckers. So size can or can’t be a good way to tell them apart. For me, the biggest difference is the size of the bill. In the most simple terms, downys have small bills and hairys have big bills. Beyond that, the bill of the downy just looks small and rather fragile. It isn’t fragile, of course, it’s quite strong. It just looks small and fragile. The bill of the Hairy Woodpecker, on the other hand, looks more sturdy and substantial. 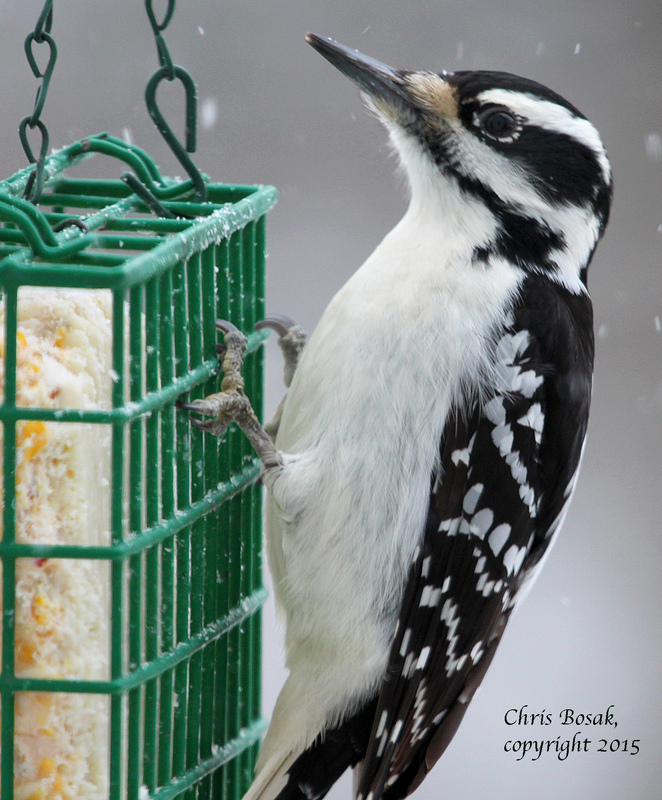 If one or the other lands on your feeder, check out the bill — dainty downy or hardy hairy. Side-by-side comparison of Hairy and Downy Woodpeckers’ bills. Female Hairy on the left, female downy on the right. This entry was posted in backyard birding, bird feeding, Woodpeckers and tagged chris bosak nature photographer, hairy and downy bill comparison, hairy and downy woodpeckers, hairy and downy woodpeckers difference by Chris Bosak. Bookmark the permalink. Thanks for the side-by-side; that makes your point quite well. You are right about it taking a while for beginners to see this difference. You’re right, the hairy is beefier. But for us novices, alas, they won’t be sitting side by side! There’s one nearby place in Central Park where I often see one of them. I’ll try to figure out which it is. HI Susan. Not only do they not sit side by side, but they often don’t sit still for very long either, which adds to the drama. Try to get a look at the bill if you can. That will give it away. Thanks Susan and good luck.